He wanted to be a Marine fighter pilot. The US was building up their military force, but they were not at war yet and the Navy required all its potential Navy and Marine pilots to have two years of college. So Ed started classes at Boston College. When Pearl Harbor was attacked the Army and the Navy both dropped the college requirement and Ed applied to the Marines. His primary flight training was in Dallas and then he went to Pensacola, Florida. He was carrier qualified, which means he knew how to perform a controlled crash of his single engine fighter, onto the rolling deck of a Navy floating runway. It took Ed almost two years to get through all the Navy flight training. His problem was he was a very good pilot and the Marines needed flight instructors. 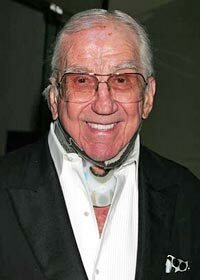 Ed McMahon He had a great command presence and public speaking ability, which landed him in the classroom, training new baby Marine pilots. His orders to the Pacific fleet and the chance to fly combat missions off a carrier came in the spring of 1945, on the same day the Atomic bomb was dropped on Hiroshima. Of course his orders where changed. He never went to sea and he was out of the Marines in 1946. Ed stayed in the USMC as a reserve officer. He became a successful personality in the new TV medium, after the war. His Marine command presence helped. He was recalled to active duty during the Korean War. He never got to fly his fighter aircraft, but he saw his share of raw combat. He flew the Cessna O-1E Bird Dog, which is a single engine slow-moving unarmed plane. He functioned as an artillery spotter for the Marine batteries on the ground and as a forward controller for the Navy and Marine fighter / bombers who flew in on fast moving jet engines, bombed the area and were gone in seconds. Captain Ed was still circling the enemy looking for more targets, all the time taking North Korean and Chinese ground fire. He stayed with the Marines as a reserve officer and retired in 1966 as a Colonel. The world knows Ed as Ed McMahon of the Johnny Carson, Tonight Show. One night I was watching the show when the subject of Colonel McMahon earning a number of Navy Air Medals came up. Carson, a former Navy officer, understood the significance of these medals, but McMahon shrugged it off, saying that if you flew enough combat missions they just sort of gave them to you. McMahon flew 85 combat missions over North Korea; he earned every one of those Air Medals. The casualty rate, for flying forward air controllers in Korea sometimes exceeded 50% of a squadron's manpower. McMahon was lucky to have gotten home from that war. Once a Marine, always a Marine. When the public was spitting (taking their personal safety into their own hands) at Marines on the streets of Southern California during Vietnam, Colonel McMahon was taking Marines off the streets and into his posh Beverley Hills home. I spoke to a retired Marine aircrew member the day Colonel McMahon died and he personally remembered seeing McMahon at numerous Marine Air Bases in California in the 1960s. He was known for going to the Navy hospitals and visiting the wounded Marines and Sailors from this country's conflicts, even in the last years of his life. Colonel McMahon presented awards and decorations to fellow Marines and attended many a Marine ceremony and the annual Marine Corps Birthday Ball. He stayed true to his Corps as a board member of the Marine Corps Scholarship Fund and as the honorary chairman of the National Marine Corps Aviation Museum. After retiring from the Marine Reserve, one night on the Johnny Carson show, members of the California Air National Guard came on stage. Colonel McMahon was commissioned a Brigadier General in the Air Guard in front of millions of Americans who watched it happen live. You will not see anything like that on TV anymore. The three core values of a United States Marine are; honor, courage and commitment. This is what a Marine is taught from the first day of training and this is what that Marine believes. That was Colonel Edward P. McMahon Jr. USMCR Retired. Before he was a national figure he was a true combat hero and a patriot the nation needed then and this country needs now. Your war is over. Thank you Colonel McMahon. Semper Fi, Sir. Major Van E. Harl, USAF Ret., was a career police officer in the U.S. Air Force. He was the Deputy Chief of police at two Air Force Bases and the Commander of Law Enforcement Operations at another. Major Harl is a graduate of the U.S. Army Infantry School, the Air Force Squadron Officer School and the Air Command and Staff College. After retiring from the Air Force he was a state police officer in Nevada.